Now that you know what a conversion rate is, it is time to learn a little about Conversion Rate Optimization. CRO is defined by Wikipedia as “the science and art of creating an experience for a website visitor with the goal of converting the visitor into a customer.” We all know that we can have thousands of visitors, but if they aren’t translated into customers, our business will not be successful. Improving your conversion rate requires a blend of both art and science, so you either need to be a well rounded person yourself, or hire a team that gives you both sides of the coin. 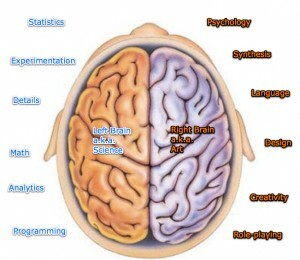 It is sometimes helpful when thinking of art and science to imagine the two sides of the brain. The left controls the science portion, and the right is for the artistic side. Too much reliance on the left leads to being overly concerned with statistics and systems. An over emphasis on the right will cause you to rely on aesthetics and cleverness. So what skills do you need? I thought you would never ask! Basic skills in Statistics – You need to know basic statistical principles in order to be able to understand the data you gather in terms of ratios, percentages, etc. Simple mathematics – No trig or calculus needed, but a basic understanding of how to calculate percentages, add, subtract, multiply, and divide, are required. Limiting variables – Any good scientist knows that too many variables can cause an experiment to go off the rails. Isolating these variables so they don’t effect the outcome is purely a left-brained skill. Analysis – You must be able to interpret the data you see by looking at patterns, common effects, limitations, etc. Attention to Detail – Once the big issues are fixed, it is the little things that will make the difference in converting visitors to customers. The left brain helps us to seek out the small details that need correction. Sure the scientific mind is absolutely necessary for conversion rate optimization, but the artistic one is just as important. You might describe the science side as more behind the scenes, and the artistic side as front and center stage. Make sure that your team has people with some or all of these right-brained skills for the best results. Design – How your site looks and functions will have a tremendous impact on conversion rate. You must have skilled designers in house, or be one yourself. Psychology – It isn’t enough to know how people act in a given situation, you must also know why they act that way. Also, people will claim they act one way in a survey, and do something different when they are put in the situation. The intuition needed to predict and understand this behavior is found in the right brain. Role Playing – Another crucial right-brained skill is the ability to put yourself in the shoes of your visitors. Thinking Outside the “Box” – Yes, this is a cliche term for creative thinking, but it is still a critical skill. When things don’t go according to plan, when one test group vastly outperforms another, and when “best practices” don’t produce best results, you have to be able to think about the situation from all angles, and in unconventional ways. This skill lives in the right brain, and is an art in itself. CRO is tricky stuff. It requires a diverse set of skills to be done effectively. Most people aren’t perfectly balanced between right and left brain. If you are fortunate enough to be one of them, you probably already have a site with a high conversion rate. If you are like most of the world, you are going to need to construct a team that will fill in the gaps, or possibly be polar opposites to you in order to achieve success with your site. If you take the time to put together the right people, and get them working together like a well-oiled machine, you will be very pleased with the end result.